Robert Aumann is a professor at the Federmann Center for the Study of Rationality in the Hebrew University of Jerusalem in Israel. 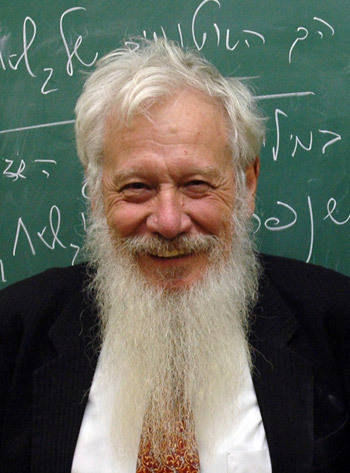 He received the 2005 Nobel Memorial Prize in Economics (with Thomas Schelling) for his work on conflict and cooperation through game-theory analysis. Aumann’s best-known contributions are in the realm of repeated games. He was also the first to define and study the concept of correlated equilibrium in game theory, and the first to supply a formal account of the notion of common knowledge, leading to his agreement theorem. Professor Aumann received his Ph.D. in mathematics from MIT. He is a member of the American Academy of Arts and Sciences, the National Academy of Sciences (USA), the British Academy, and the Israel Academy of Sciences; holds honorary doctorates from the Universities of Chicago, Bonn, Louvain, City University of New York, Bar Ilan University, and Ben-Gurion University; is the author of over ninety scientific papers and six books; and has held visiting positions at Princeton, Yale, Berkeley, Louvain, Stanford, Stony Brook, and NYU.